March has definitely blown in like a lion here in Kentucky, and as is typical for March, the temperatures will be swinging up and down. Last night before I went to bed the temperature was 61 degrees. I woke to the sound of pouring rain this morning which will turn to snow as the temperature falls during the day and by Friday morning we will be hovering around zero. The good thing about March is that the cold and snow won't hang around like it did in February. By the middle of next week we should be back up to that wonderful 60 mark. While Mother Nature is doing her crazy dance outside, inside I am feeling warm and serene. I feel not only excited about the coming of spring, but also about all of the changes that are happening in my own life. 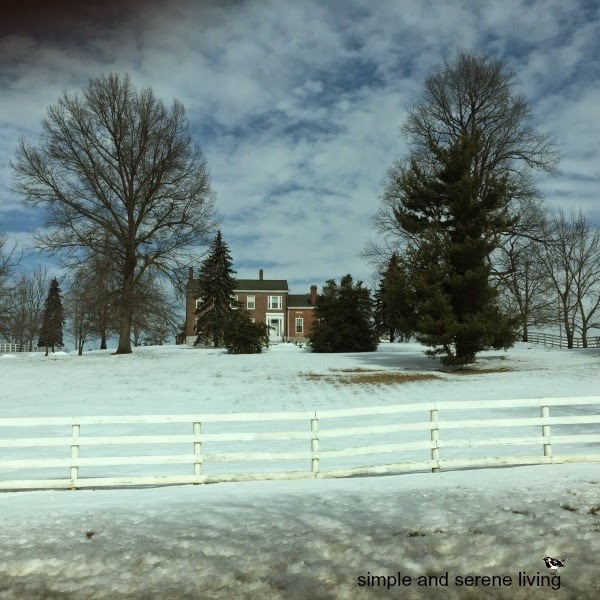 Jen and I are working on our project, which will be revealed soon, I am busily working on converting my blog to the new Simple and Serene Living URL, and I am even finding some time for sewing. 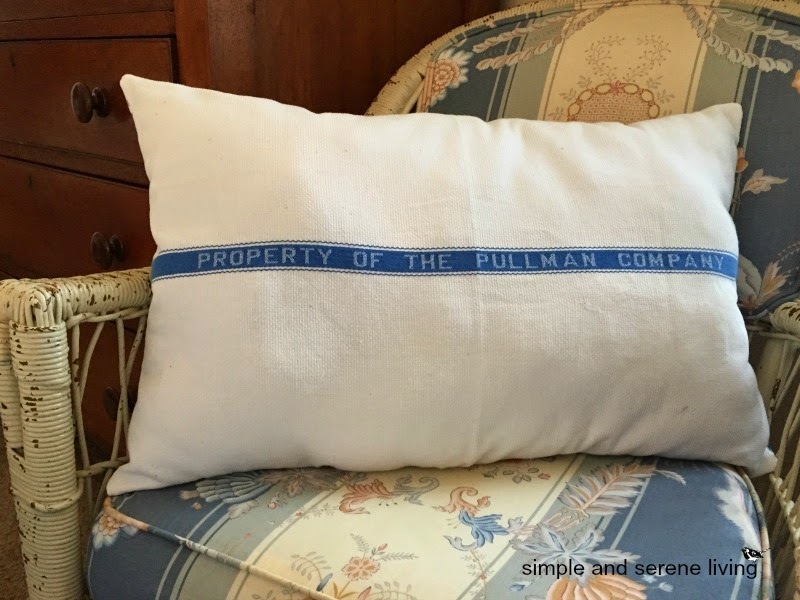 You may remember the vintage Pullman towel and the Waverly fabric I shared here. Thanks Kelly for letting me know that the pattern name is Blue Savoy. I love it and made a pillow for my bed using the fabric and towel. It looks perfect on my bed, but I am not going to show you that photo because I have a bed reveal coming up soon. This seems like the perfect time to grab a cup of hot tea and do some visiting. I hope you all have a wonderfully serene day, and if you are experiencing bad weather please stay safe and warm. we have rain falling this morning, turning to sleet again this afternoon in texas, too. our spring is very delayed. Thank you, Thammie. Have a wonderful day. Laura, so glad you are feeling positive and moving forward with the blog changes. It isn't raining today so I am determined to get outside for a bit and run some errands. This has been a hard time for me, being sick and just feeling so low. Time to get my energy back and move forward! I hope you are feeling better, Linda. So many people have been really sick this winter. Hopefully some warmer temps will blow in soon and lift all of our spirits. Have a fun day. Thanks Deb. Looks like I will be snowed in for the next two or three days. You are so welcome! I have always loved that pattern and color together. I love how you put two different fabrics together on that pillow. Now it's 2 pillows in one! Your first picture on this post is beautiful!!!! It looks like a painting. Is that house near you? We are having mild temps today with the high around 70. (Insert big smile here!) However, it's short lived. We are expecting colder weather and rain the rest of the week. So, I better enjoy today while it lasts. 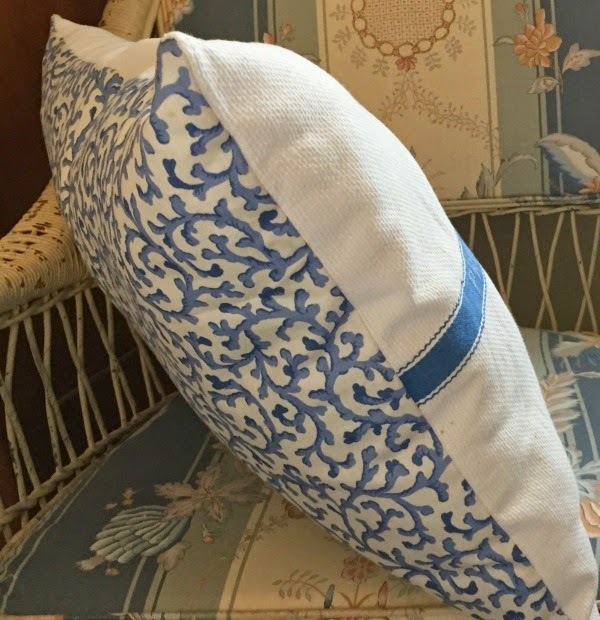 I love that fabric and I'm glad I got a pretty big piece, because I am going to want to make some more pillows. I had to really restrain my self to keep from heading to Atlanta. Now I'm going to be snowed in. I pass that house on my way to the Thursday afternoon auction I go to. We have so many places like that here. It is a beautiful area. Me too, Susie. I have my sandals all ready for when we get up into the 60s at the end of next week. I can't wait. Thanks for the pillow love. I love that pillow...that's gorgeous! Love the texture, the vintage feel, and the colors!!!! Am I excited or what? What gorgeous skies..that would be me too, outside with the camera taking shots. Thanks, Jen. The snow has really piled up overnight. I'm afraid to venture beyond my patio for the moment as there is a solid sheet of ice under the snow. IT was a brief and lovely moment. They say it will be back next week. Can't wait. That is a beautiful pillow. It is sleeting here at my central KY farm. Rained a flood all last night and today. Cannot imagine snow on top of all of that! Stay safe and warm! I know like me you are snowbound this morning, Michelle. Hope everyone is safe. Stay safe, Daniella. I hope you didn't get as much as we did overnight. I love your pillow! Our weather is fluctuating here, too. I'm ready for a steady stream of nice warm days! Thank you, Cheryl. I am sooooo ready for a stream of nice warm weather. Love the pillow it is super cute. It is very cold here in Chicago land but it is going to warm up this week end and then I think stay a little warmer so I think we are all turning the corner on winter. Have a great day yourself.